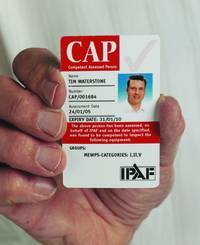 The IPAF Competent Assessed Persons (CAP) programme focuses on a crucial aspect of safety – that of the machine itself. This course provides guidance for platform engineers on compliance with regulatory requirements and offers documented evidence that individuals can be regarded as competent persons to plan, manage or carry out thorough examinations of powered access equipment within the context of current legislation. As an IPAF-approved training centre our experienced engineers provide guidance through presentations and individual assessments. Successful assessment provides suitable candidates with the valuable documentary evidence that they are certified as competent persons to plan, manage or carry out thorough examinations of platforms in the context of current legislation including the Work at Height Regulations, LOLER and PUWER 98.